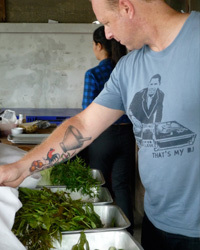 I was browsing the NY Times Travel section when I came across an article (excerpts below) about the NY Times traveling to Chiang Mai, Thailand with Portland creative genius, chef and restauranteur Andy Ricker. "Mr. Ricker, a 47-year-old, six-foot-tall native Vermonter now based in Portland, Ore., has become an unlikely ambassador for Thai food in the United States. Your only visual clue that he is someone who knows his nahm phrik noom from his nahm phrik ong is a glimpse at his right arm, which is tattooed with a mortar and pestle, bird’s eye chiles, and the holy trinity of northern Thai herbs — cilantro, green onion and phak chi farang (the last often known in the West as sawtooth)." 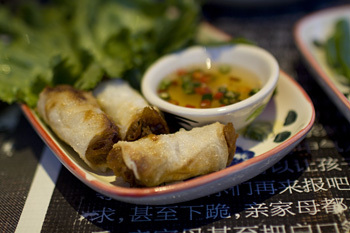 I have been to 3 of the 4 restaurants Ricker has developed here in Portland (Ping, Pok Pok and the Whiskey Soda Lounge) and while being a lover of Thai food I can't help but agree with the author of this article that until I went to Ping I hadn't experienced the vast universe that can be (and is) authentic Thai. "I was struck by his refusal to pander to Western tastes. Instead of pushing pad thai and peanut sauce, he serves hoy thawt, an egg-and-mussel crepe found at Thai night markets, and northern-Thai-style laap. Rather than the tart, spicy minced-meat “salad” from the northeast that most adventurous American eaters recognize, this version is spiked with blood and offal, and fragrant dried spices that give it a beguilingly bitter edge. Mr. Ricker now presides over a mini-empire in Portland with four restaurants (including Ping and Whiskey Soda Lounge) that serve food you rarely see outside of Southeast Asia." The first time I went to Ping was with my coworkers in a celebration of the holidays and my boss's 5 year anniversary with the company. I blogged about it here. I feel so in love with the cuisine that when a friend came up from the Oakland area we went right from the train station to reservations at Ping. I've only been twice but it's always on my radar for possible dining options. During that same out-of-town visit, the friend and I went to Pok Pok for lunch (my first time there even though it's only a few minutes down the road from where I live). We sat at the counter and was helped by a knowledgeable bartender who helped me select the perfect drinking vinegar to compliment my Khao Muu Daeng. A few months later I figured I had to complete the Holy Trinity (this was before Pok Pok Noi opened) and when another friend came into town we headed to the Whiskey Soda Lounge for some drinks and bar snacks. 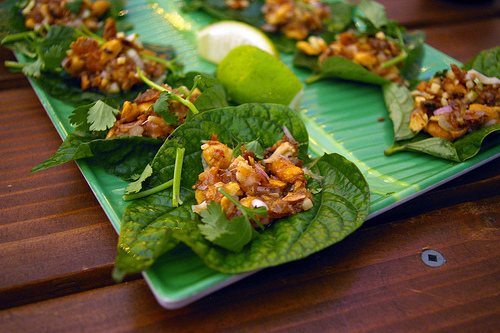 (Warning: Beware the Miang Kham! I can do spicy but these little chilies scorched my mouth. Iron taste buds needed). I've always had a desire to go to Thailand...and perhaps someday I'll make that dream come true...for now I'll settle for the flavors Andy Ricker offers. You've got me intrigued! Next time I'm home, I'm going to check his places out.